Black Jack the oval drum is 3 1/4” tall, 5” long, and 3 1/4” wide. 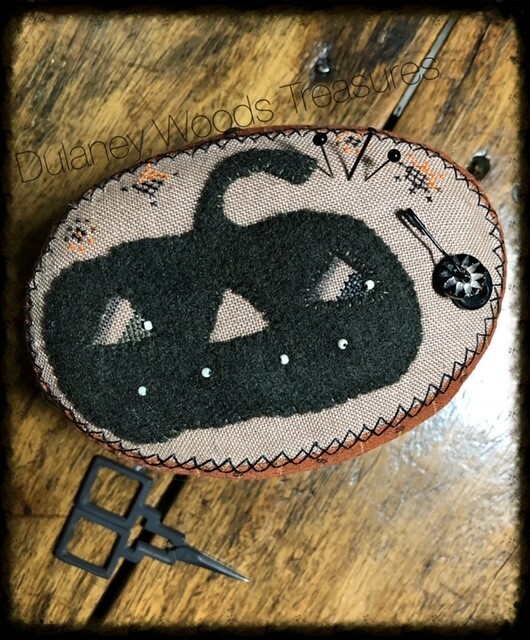 The adorable black wool pumpkin has been appliqued to mystery linen. His eyes are cross-stitched in and the little star like motifs are stitched using a limited thread by Weeks Dye Works. I also used white glass seed beads for his eyes and his smile. The side of the oval drum is a lovely rust orange fabric with cream stripes and little black circles from Moda. It has been stuffed with sawdust shavings, lavender, and walnut shells. It has been adorned with black glass headed pins and a few antique buttons from my collection. Asking $65 plus $8 for US shipping.